The subject of the Chairman's Address this year was Planetary Nebulae. These incredibly beautiful celestial objects are surprisingly complex and Dave provided us with an overview of the history and science of these objects, as well as their evolution. This is very much an active area of research for astronomers and Dave considered the latest insights and findings before discussing the challenges that remain. A big thank you to all those that came along yesterday evening and through the night. It was a very successful event and it would seem from the laughter and jokes, a fun night too. We topped out at 17 Astronomers coming and going over the night probably due to the clear skies. We had a record number of new members attend and I do hope our longer term members were able to help you all. I myself was helped by Mark who was extremely kind in running back and forth to his house in the village to collect all the things I had forgot, so my thanks to him. I personally bagged a mere 61 objects. Chatting to others, problems with my initial setup of the equipment and performing taxi duty to my daughter at midnight affected my count. I know for sure others were more successful with Kieth and Chris I believe grabbing in excess of 80 objects! Well done guys. The night was cold and slightly windy to start, easing off after midnight. It was a great pleasure when Ian turned up, all the way from Camberly with hot hamburgers and pies! The group all too briefly came together around a borrowed wooden table to chat, eat and exchange challenges with equipment, before drifting off back to small areas of grass that were to be home for the rest of the night. Not withstanding the clocks changing, nobody noticed the stars jumping to keep up with our peculiar change of time as the extra hour sprung forward at 1am. The final 5, Chris, Kieth, Alan, JBS and myself packed up around 4pm to head home for Mothers Day for some and just a long sleep for others. Thank you once again to all, you are the ones that make these events successful and I look forward to knowing who bagged the most Messier objects for this 2017 Messier Marathon? BAS 7 Astrophotographers set off for their Expedition to La Palma in the Canary Islands. Facing tough conditions, Alan Lorrain, John Murphy, Ian Piper, Dave Shave-Wall, Tim Powell, John Barrie-Smith and Bob Trevan venture up to 7,500ft above sea level for 6 nights of astrophotography on the mountain top of La Palma. One of the worlds top 3 best observing sites and home to over 20 observatories. The society pitched their awning on the field at the fete and met many adults and children during the event. Members, John Barrie-Smith, John Stapleton and Tristram Reed can be seen speaking with the public. The society supported the local Library within the Discovery Centre this month, running a 3 hour session for children and a 2 hour session for adults. We took 158 children and adults through the solar system, the Eclipse, showed them a beutiful brass Orrery along with many other displays. Adults at the second event were enthused by seeing Jupiter through telescopes and entertained with stories of why Pluto maybe should be a planet. My thanks to everyone who tried to confirm my suspect SN PSN J17143828+4340517 and especially to the heroic effort by Dave Shave-Wall. Isn't strange how serendipity plays its hand? When I came indoors I was alerted to an 'Astronomers Telegram' (ATEL 6673) that spectroscopic classification had been obtained with the 2 metre Himalayan Chandra Telescope at the Indian Astronomical Observatory. I had almost given up hope of this object ever being classified. The pros trawl through the pages on the TOCP and David Bishop's web site for as many confirmatory observations as possible before they commit telescope time. Perhaps one day I might explain the reporting procedure for SNe and Novae; it is much more difficult than it used to be. Amateurs are finding it increasingly difficult to get past all the obstacles and many SNe pass by without receiving a classification. We spend hundreds of hours and take thousands of images to get a discovery which is quite frustrating. P Cygni, also known as 34 Cygni, is variable star in Cygnus. It's what is known as a Luminous Blue Variable or LBV in the trade. They are short-lived, massive stars at temperatures of around 25,000 degrees C and end their lives in a massive explosion - a supernova. They can exhibit several massive outbursts before total eruption and are often confused with Type IIn supernovae having a very similar appearance. For this reason they have been called "Supernova Imposters" and only by closely studying a spectrogram can their true identity be distinguished. The spectrogram of P Cygni is a very bright example. We participated in International "SUNday" last Sunday - http://solarastronomy.org/sunday.html. It was a fun picnic but we were mostly sabotaged by the clouds, as usual! 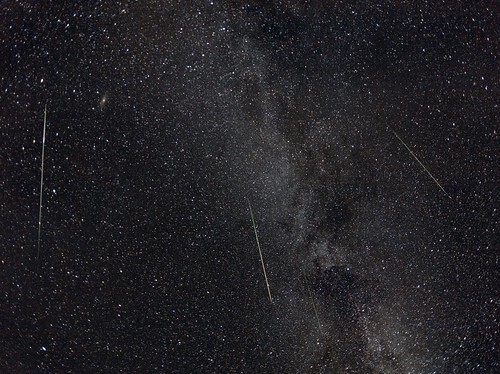 Missed the Perseids meteor shower? Never mind, they'll be back next year, but in the meantime the image below by BAS Member John Murphy, is a composite image of his 4 best from a collection of 1074 images taken with a DSLR and a 20mm f2.8 lens. The background was created from a stack of 30 images of the Milky Way. And here are a couple of images from another BAS member Bob Trevan. Both taken with a Canon 5D with a 17-40mm f4.5 lens @ ISO 1600 over 60 seconds. This image of comet PANSTARRS masks the difficulty we all had last week trying to find this elusive object. Taken in Devon at about 8pm on 17th March, John Barrie-Smith used a Canon 550D with a 200mm f2.5 lens mounted on an AstroTrac mount to capture this impressive image. Just to prove you don't need the Hubble Space telescope in your back garden to take great images. This impressive picture was taken by John Barrie-Smith, with a normal digital SLR with a 200mm lens. The only 'special' bit of equipment he used was an Astrotrac to guide the camera as the stars track across the night sky. The first star of Orions belt is the brightest object near the top left corner of the image, with the Flame Nebula (NGC2024) to the left of that. The Great Orion Nebula (M42) can be seen clearly toward the lower right corner. We would like to thank Nigel Ball for a great talk this week on "Pretty pictures from suburbia". It is amazing what can be achieved despite the issues of light pollution. Following on from the recent talk by Mark Kidger from the European Space Agency on "Living the Herschel Dream, 4 years of Science, 30 Years of Planning", you can find more info on the space observatory here. For those interested in Guy Hursts' talk a while ago here is a link to his publication The Astronomer. For more information on the recent talk by Ian Ridpath click HERE to visit his website. Following on from Dave Shave-Walls' talk on the Mars Science Laboratory expedition, here is a side by side comparison video of the landing (the first 8 seconds are black). Dave's presentation is below. For more information and latest MSL mission status click the image below to visit the NASA JPL website.